Congratulations and thank you to everyone that applied for the first Youtube round! 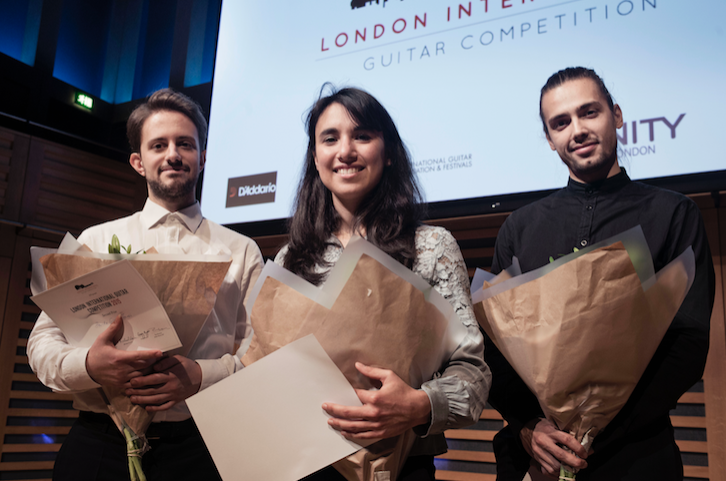 We are pleased to announce the contestants for the second round of London International Guitar Competition 2018! More info. to follow very soon about the semi-final on 26 October in London. Become a EuroStrings Artist and participate in concerts at the Eurostrings festivals collaborative 2019 (maximum of 17, minimum of 8 concerts around Europe). See more about EuroStrings here. Entry into the 2nd Eurostrings International Guitar Competion held at the IGF Guitar Summit in London in July 2019 , first Prize 5000 Euros plus European tour and concerts in China and the USA in 2019. After the First Round on Youtube six Semifinalists were invited to travel to London for the Semi-Final and Final. The six Semi-Finalists will play London Blues 2 by Graham Lynch as part of a free programme of up to 20 min in total duration each. They are: Giacomo Susani (Italian), Pietro Locatto (Italian), Sasha Savaloni (Iranian Scottish), Bradley Johnson (British), Tormund Vea (Norwegian) and Dmytro Omelchak (Ukranian). After all six Semi-Finalists have performed, the expert jury will meet briefly to decide on the successful three finalists. These will be announced to close the Semi-Final. The 3 Finalists will perform the famous Concierto de Aranjuez by Joaquín Rodrigo as well as ‘Orpheus’, a short new work by Graham Lynch specially commissioned by IGF (International Guitar Foundation) for London International Guitar Competition. The orchestra is the brilliant young Newham Philharmonic, an orchestra for young Londoners conducted by James Hamm. In 2015 Daniela Rossi was the London International Guitar Competition Final winner and now she returns to Kings Place for her debut performance with Newham Philharmonic to perform Rodrigo’s Concierto de Aranjuez and a specially commissioned piece by Graham Lynch for London International Guitar Competition 2016. The Orchestra will also perform Symphony No. 6 by Ludwig van Beethoven, under the baton of James Ham( London Orchestra Project). Find out everything you need to know about how to apply by clicking ‘Apply’ above. London International Guitar Competition would like to say a very big thank you to all 2013’s participants, our world-class jury, Kings Place, Royal College of Music, Classical Guitar Magazine, Trinity College London and Savarez.